Historical background – Ramla was founded between 705-715 AD as the capital city of the province Palestine, by the ruler Suleiman Abed El-Malich from the Umayyad Dynasty. The name Ramla was given to the city because it was built on sandy land, "Ramel" means sand in Arabic. Ramla was established as a Muslim administration city. Hence after a short period after the city was established its leaders invited Christians and Jews to settle down in the city. So a few generations after its foundation, Ramla became a multicultural city. The Museum was established in the year 2001. The building was originally used as the City Hall (1922-1948). In the building the eastern architectural motif can be seen, such as pointed arches, resets, illustrated floorings, wall and ceiling ornaments, etc. These motives were popular in Ramla at the end of the 19th century and the beginning of the 20th century. A detailed historical timetable is hung on the left wall of the entrance. The room presents the everyday life in Ramla in the Middle Ages. The display cabinets are divided into subjects. In the room there are also two models, the arched Pool and The White Mosque complex. Cabinet 1: Agriculture, industry and trade in Ramla. Coins of the city Ramla (3) bearing on one side the stamp "Palestine", many ceramic objects especially ceramic oil lamps that represents the widespread ceramic industry of the city. Soap (10) represents the famous oil industry of the city. In Ramla the oil corporation was specialized in the production of "Zeit El-Anfak", a special olive oil that in also mentioned in Jewish sources as an oil that was made out of the juice from unripe olives. The oil is very concentrated and is especially good for the cosmetic and medical industries. Many medieval authors recognized the fertility and the good soil around the city. In the cabinet there are demo fruits that symbolize the prosperity of the agricultural environment and bazaars of the city. Mosaic: The mosaic in front of you is a duplicate of a mosaic that was found in excavation in the Old City (The original is in the Israel Museum). On the mosaic, an arch is described, probably represents a "Michrab" (a niche in a wall of a mosque that directs the worshiper to Mecca). In the arch there is an Arabic inscription that urges the people "Hurry and pray". Under the mosaic are two gravestones that are engraved in ancient Arabic script called "Kufi". Cabinet 2: Christianity and Christians in Ramla. The lower part represents the Byzantine Era. You can see a comb from a bone (7), small bowls (16), ornamented vase (11), statue of a crocodile (1) whose origin is Egypt, cuff pins (9) and glass bottle (6). The upper part represents the Crusade period, pay attention to the glazed objects. 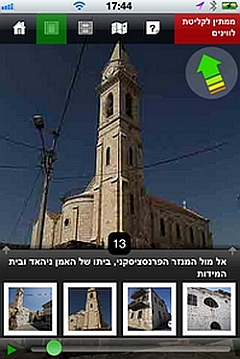 Holy Ark: expresses the Jewish community in Ramla. On the ark and inside it, one may read letters that were found in the "Gniza" – repository for old religious items and documents in the synagogue "Even Ezra" in Cairo, Egypt. Among the items, was found a `Karaism` document about divorce, land leasing and cry for help from the Jews in Ramla after the pogroms that the community experienced by the Islamic ethnic group. Also displayed a photograph of a Samaritan manuscript of verse from chapter A in Genesis that was carved into doorpost, it was found in "Kfar Bilu", near Ramla. Cabinets 3-4: contain objects that were used in everyday life in the middle ages. The house had an open internal yard where a large part of the daily chores were done. Among the findings you may see cooking pots, a grindstone (9), pestle, an outdoor stove used chiefly for baking bread and "Pita" (12), serving dishes (10) etc.. Cabinet 5: is about economy, commerce and art. Along the findings there are bracelets (17, 23), rings, weights (12) and scales (11), little glass bottles for cosmetic storage as blue eye shadow (6-9). In the upper part of the cabinet is displayed "The Madonna of Ramla" (1) that was probably used as a figurine of fertility (some kind of an amulet). The Madonna is described as a stocky woman – an ancient recognition for fertility. The White Mosque and the Square Tower: the White Mosque was built in the 8th century and in its time it was considered the most magnificent structure in the Umayyad Kingdom. "In all of the Islamic world there is no finest than this mosque… it is remarkable and more impressive than the Mosque of Damascus. It is called white… " (From the words of the historian Mokadesy, year 985). In the model, one may notice an underground water reservoir that was fed from the springs of "Ein Yard" (next to a Kibbutz called "Gezer"). In the 14th century the square tower was added to the mosque. It shape is typical of the Mameluks construction that was popular at that time in Israel. Cabinet 6: findings from the Ottoman Period. ceramic tiles (6) that are decorated with vegetal decorations, magic bowls (2) were used for exorcism. In the model of the city`s roof tops you can see the tower of the Mosque where the Muezzin was murdered. In the upper part of the cabinet are displayed buttons of Napoleon`s soldiers uniform (1) and a British bill that shows the square tower of Ramla. On the bottom part of the cabinet are some authentic canon balls. With the beginning of the war of independence the main road to Jerusalem was blocked by Arab rioters, some of them belonged to "Hassan Salame`s" gang. They settled in the Northwestern part of the city Ramla and disrupted the Jewish transportation near the city. Between May 16 – may 20th 1948 the IZL (the national military organization – "Etzel") soldiers attacked Ramla, however they had to retreat with the counterattack of the Arabs. During that attack 51 soldiers of the organization were killed. On July 1948, the city of Ramla was conquered by the IDF (Israel Defense Forces) during operation LRL"R (Lod Ramla Latrun Ramalla) that afterwards was called "Danny Operation". On the wall one may observe the process of the battle and the picture of the "horrible tiger" an armed jeep whose cannon scared the Arabic warriors. In the little glass cabinet you can see the drawings and letters of Danny Mass, after which the operation is called. The mass immigration that occurred with the establishment of the country forced the country to build tent cities and shacks to give the immigrants somewhere to live – "Maabarot" (transit camp). Our symbolic tent exhibits some authentic objects that were donated by the city`s residents, these objects were used by the immigrants. On the "Maabara`s" wall document such as – bicycle license, immigrant certificate, etc. are hanging. This room describes the future plans of Ramla. Pay attention to the development areas (in green) as well the model of the city`s entrance and to the tourist promenade map and the graphic expression of the renovating plans. This room is a memorial for the 175 soldiers of the city of Ramla that died in the wars of Israel from its establishment until the second Lebanon War. In respect for the fallen, one must treat this room in the respect it deserves. Please return every album to its place. Please return this information paper to its place at the end of your visit.